The deadlift is a lower body exercise, but it taxes your entire body. It is one of your core strength building exercises and deficits are a variation on the deadlift that increases the range of motion of the deadlift. Since you are forced to start your pull from a deeper starting position, the initiation of the pull will be much more difficult. This can help you improve your strength off the floor for your conventional deadlift. Stabilizers: nearly every muscle in your body, from your forearms to grip the bar; your upper back (Latissimus Dorsi, Rhomboids, Trapezius) to anchor the weight; to your core to maintain stability and transfer power from your legs through your upper body to the bar. Deficit deadlifts can be a good tool to help you build strength at the lower end of the deadlift and increase your power off the floor. It does this by increasing the range of motion of your deadlift, and done right forcing you to start from a deeper position. If a little is good, a lot isn’t necessarily better. 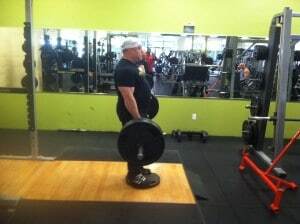 The height of the platform you stand on to create a deficit should not be so high that you cannot hit the proper setup position for your deadlift. If you have shorter arms in relation to your torso, you should use a lower platform than someone with longer arms. 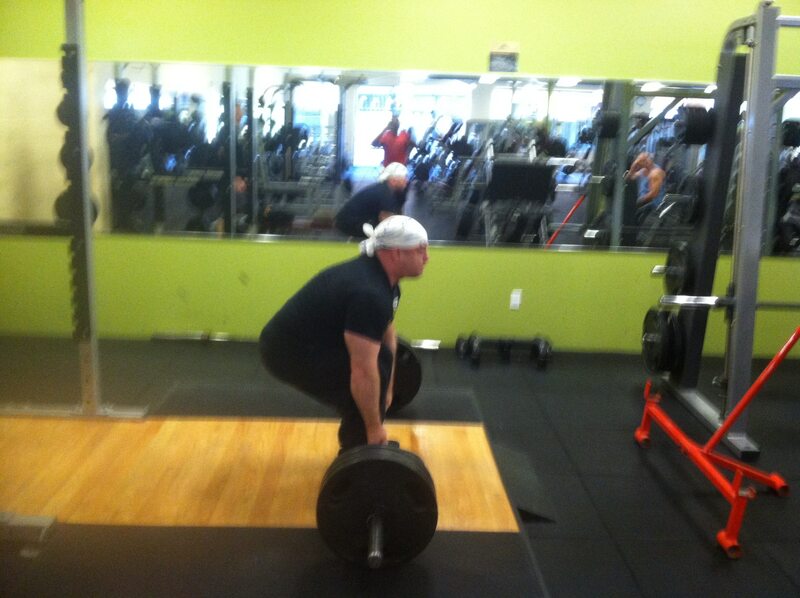 Stance/Foot Position: Stance will be similar to the conventional deadlift stance. Your feet will be placed on the platform or plates directly under your hips with the outside of your legs a plum line down from your hips. 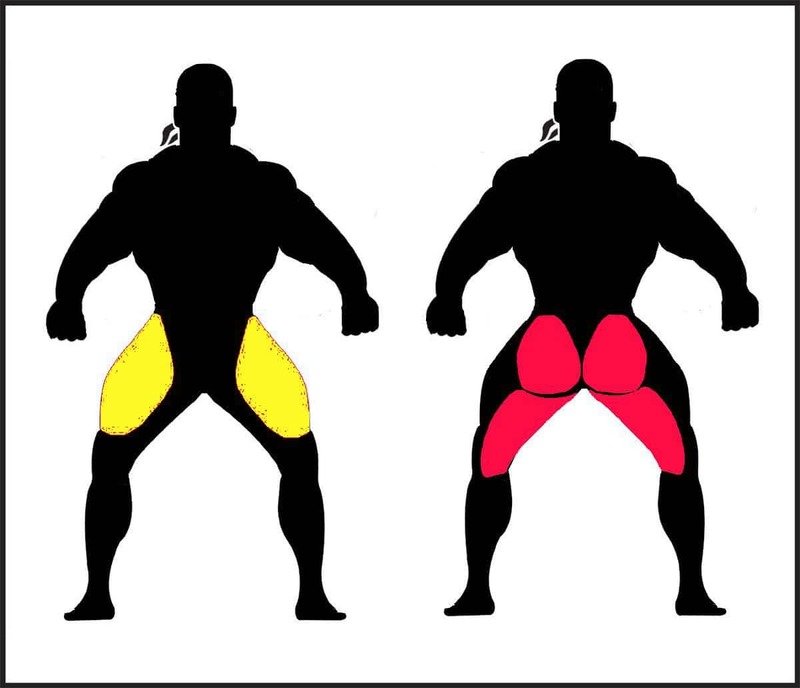 If you have wider hips, you may need to move your feet out slightly, but they should remain inside shoulder width. Your toes should point outward slightly. You should set up close to the bar, your shins should be within an inch of the bar. Hand Position: Your hands should be directly outside your hips and thighs, and best case drop straight down from your shoulders. Try to place your hands so you can grip the knurling for a better grip. Pull up slightly on the bar creating upward tension on the bar and removing any slack between you and the bar. Take a deep breath into your lungs and abdomen. Tighten your back by squeezing your shoulder blades tightly – try to tuck them into your back pockets. Keeping your back flat, rock back, lowering your hips to the starting position. Bring your hips down and your chest up until your shoulders come back just behind the bar . Keep your head and chest up and your back flat as you pull. Your hips, shoulders and the bar should rise at the same rate initially – don’t let your hips kick back and up ahead of the bar as you begin to pull. Thrust your hips forward as the barbell passes your knees and straighten your back bringing your upper body fully erect. Lock out your knees and hips, and bring your chest up to finish the lift . Deficit deadlifts will be more difficult than conventional deadlifts. Because of the increased range of motion, and increased difficulty at the starting position you should expect your lifts to be somewhat lower than your conventional deadlift. The difference should, however, be relatively slight. 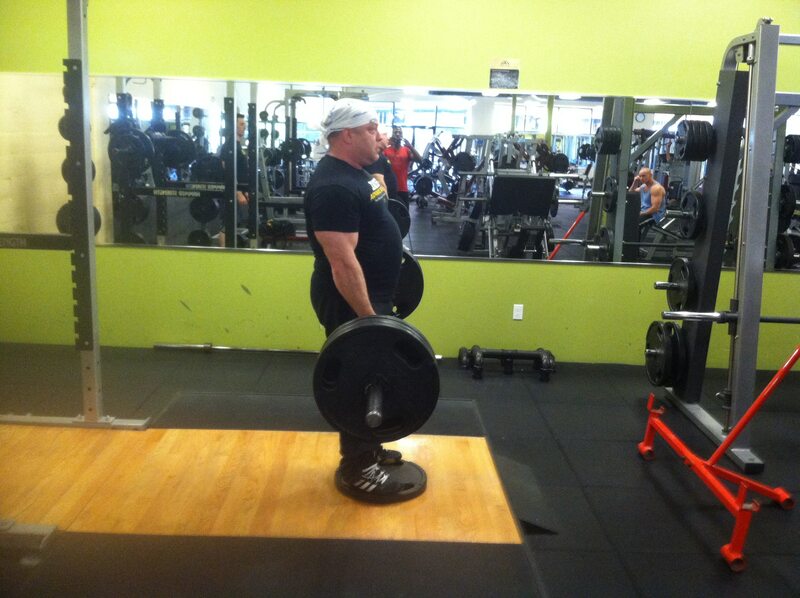 Changing your deadlift setup: The setup for deficit deadlifts should be identical to a conventional deadlift. Don’t use a platform that is too high and forces you out of your proper deadlift starting position.